Few herbs have had more uses in magic and ritual protection in European folklore than mugwort, a dark green shrub related to the famous absinthe wormwood. Best known as a dream herb used by shamans as a liquid dream pillow, mugwort essential oil has also been used to addess menstrual complaints, ease pain and inflammation, and treat parasites . Like many bitter herbs, fresh mugwort leaves are thought to stimulate digestion, and feature in Korean and Japanese cuisine, where they may be added fresh to salads or used to flavor mochi, sweet rice cakes. However, mugwort’s possibilities go far beyond its use as a garnish. Mugwort (Artemisia vulgaris) is a tall, herbaceous perennial native to temperate Europe, North Africa, Asia and parts of Alaska. Its feathery dark green leaves are coated with silver hairs underneath, and it has yellow or dark red flowers. Throughout Europe, mugwort has been deeply connected to magical protection, dreamwork, and divination. Scholars believe that the name “mugwort” may be a reference to its use as a flavoring additive in beer before Bavarian purity laws stipulated that only hops could be used for this purpose. Alternatively, the word may be from the Old English mugc, meaning moth, because it was believed that mugwort repelled moths and other insects. Mugwort was an essential traveler’s herb: keeping some of the leaves in a sachet was believed to offer protection from wild beasts and spirit possession, as well as prevent sunstroke and exhaustion . Roman soldiers used to place mugwort leaves inside their sandals to keep their feet from getting tired during long marches . Besides being used as a flavoring for beer, in England mugwort herbage was also a main ingredient in the stuffing for roast goose. During World War II when tea reached 7 shillings per pound, mugwort leaves became a popular tea substitute in the region of Cornwall. 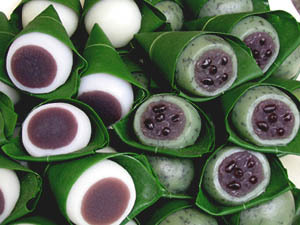 Mugwort is used to flavor Japanese sweets, such as these green mochi with red bean filling. Medicinally, mugwort essential oil has gastric stimulant, diaphoretic, anti-inflammatory and emmenagogue properties ; it is especially effective at soothing monthly menstrual pain and encouraging menstrual flow. In moxibustion, a type of traditional Chinese medicine, a cone of mugwort leaves is heated and placed on affected areas of the body for ailments such as rheumatism, lack of appetite, to expel parasites, and to induce sweating in order to break a fever . Today, mugwort is known as an exemplary dream herb: the leaves may be taken as a tea or placed under the pillow to enhance dream recall . Similarly, mugwort essential oil may be diffused into a bedroom or diluted and used as a pillow spray in dreamwork. Due to its thujone content, mugwort oil should always be used sparingly in dilution, and should never be taken internally. A few drops of a mugwort oil blend in a diffuser or room spray are all it takes to induce vivid, memorable dreams that can be recalled upon waking. 1. “Health Benefits of Mugwort Essential Oil”. Organic Facts. Accessed May 8th, 2014. http://www.organicfacts.net/health-benefits/essential-oils/health-benefits-of-mugwort-essential-oil.html. 2. Wright, Colin (ed.). 2002. Artemisia. London, New York: Taylor & Francis. 3. “Mugwort Leaf (ai ye)”. Acupuncture Today: The Acupuncture and Oriental Medicine News Source. 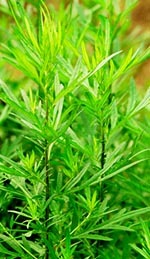 Accessed May 8th, 2014. http://www.acupuncturetoday.com/herbcentral/mugwort_leaf.php. 4. “Mugwort: Artemisia vulgaris“. Annie’s Remedy: Essential Oils and Herbs. Accessed May 8th, 2014. http://www.anniesremedy.com/herb_detail106.php. This entry was posted in Aromatherapy, Essential Oils and tagged lucid dreaming oil on November 26, 2013 by Keith Cleversley.